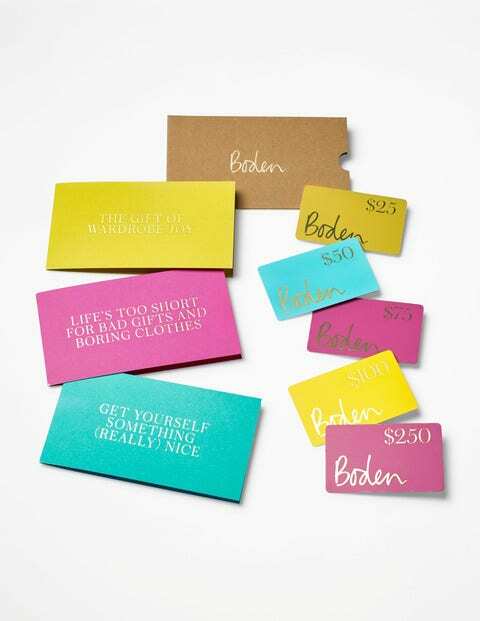 The perfect way to give a great present, without the worry of getting it wrong, Boden gift cards could not be simpler to use. Magically appearing (by post, to yourself or the lucky recipient) without any extra cost, they have a long number on the back which you enter when placing an order online or by the telephone. That's all there is to it. Simple. So choose any combination from the grid below. And remember, our gorgeous gift cards are not just for Christmas.